It turned out that this weekend the girls had no soccer and no gymnastics. A pretty rare occurrence. There were no triathlons this weekend, and even if there were, given the state of my ankle, I am not sure racing a triathlon would have been the best thing. 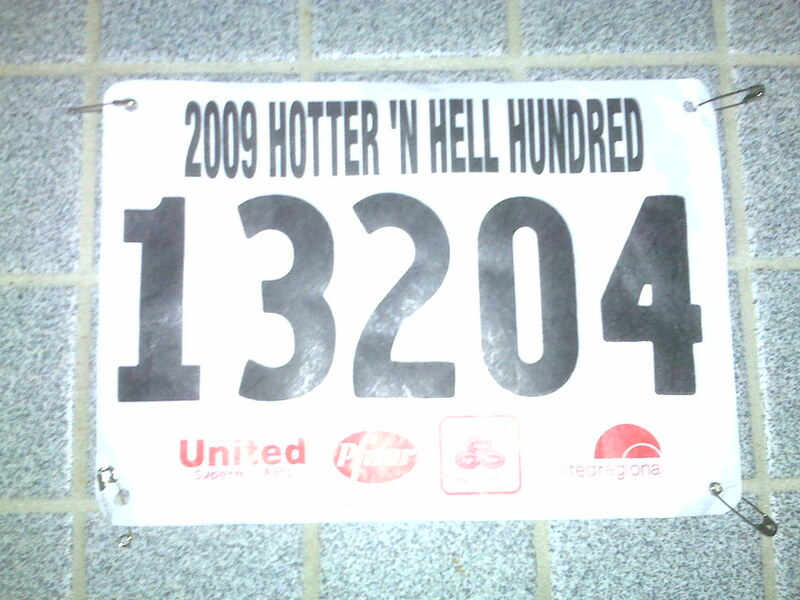 I am not sure when I noticed it, but at some point it occurred to me that this weekend was the Hotter N Hell 100 mile bike extravaganza. I checked with Fran and she was cool with the idea. My Buddy SuperDave had mentioned to me several times that I should check this thing out. So I sent him an email and sure enough him and his brother, SuperMike were both heading up there. Perfect. I hit the sack early last night, and then got up at 2:15 AM to meet Dave and Mike. We hit the road up to Wichita Falls Texas at 3:00 AM. The ride was uneventful and were there a bit after 5:00 AM. After a pretty short check in procedure, Dave and I woofed down some eggs and sausage for breakfast and I woofed down a couple of cups of bad coffee as well. Then we got dressed, got the bikes and headed to the start. After the singing of the Anthem (I found out later Carly Patterson did the honors), Shephard Air Force Base sent some T38s for a fly over. They came over in missing man formation presumably in tribute to Ted Kennedy. Then they fired off a big cannon and we were off. Sort of. Well not really. The road was packed. It took us a few minutes before we could scoot the bikes along with one foot on the ground and one in the pedal. A few more minutes and we were at the start line and _then_ we could actually ride! It was an amazing thing to be riding in a pack of bikes that stretched out in front of me as far as I could see. It was also easy to get caught up in hammering away. Mike suggested a top speed of 22. And so we rode this way for the first 20 miles. There were rest stops every ten miles. After the 20 mile rest, the crowd thinned out and we were able to hook in on the back of whoever was putting the hammer down. Lots of fun. We were flying along until Mike suggested a stop at the 50 mile rest stop. I got off my bike and someone came walking by with a tray of cookies. I'll have one of those, thank you very much! And then there were people walking around with big pitchers full of Ice and Water or Ice and Gatorade. I opened my water bottles and they loaded them up. Too Cool. Then I noticed that they were serving some polish sausage with kraut in the back. I grabbed one of those too. Dave was skepitcal, but he also could not resist. The perfect snack! We got back on the bikes, found some speedsters and made our way to the 80 mile rest area - which was actually at 75 miles according to my odometer. There we loaded the bottles up again. I had another cookie and some jelly beans. The riders were not going nearly as hard now. After 10 miles, I decided it was time to take control and I put the hammer down. I did a strong pull for a couple of miles. When I sat up, this guy on a Cervelo Tri bike said, "dude, your lost your friend a while back there." I could not see either mike or dave. I took a bit of a rest, then I started picking off the pack. I hooked took some pulls with some other guys and then found myself back by myself. But I had caught back up to Cervelo dude and invited him to come along. I pulled for several more miles until about 97, and then I sat on Cervelo guy for the last three miles into town. Dave and Mike Turned up a few minutes later, so all was good. Overall this was a really fun event. Stats: 100.1 miles, Ave Speed 20.6, Ave CAD 81, Ride Time 4:50:28. It was a tough week having to deal with the gimpy ankle. I spent most of the week icing the crap out of it. I brought the industrial strength ice pack that I got when they fixed my knee to work with me to keep that sucker iced down. The standard recipe for a sprain is RICE, where the "R" means rest. Unfortunately I don't do rest very well. Monday I took it easy. Instead of plyometrics, I did an easy 4.5 mile run with 80 pushups and 140 crunches. That went pretty well, so Tuesdays I hit the pool for 3200M Swim. The ankle hurt a bit pushing off the wall, but given that it was a 25M pool, I only had to do 128 pushes off the wall. Simple! Post swim my weight was at 169!! OK thats like the highest in a year. 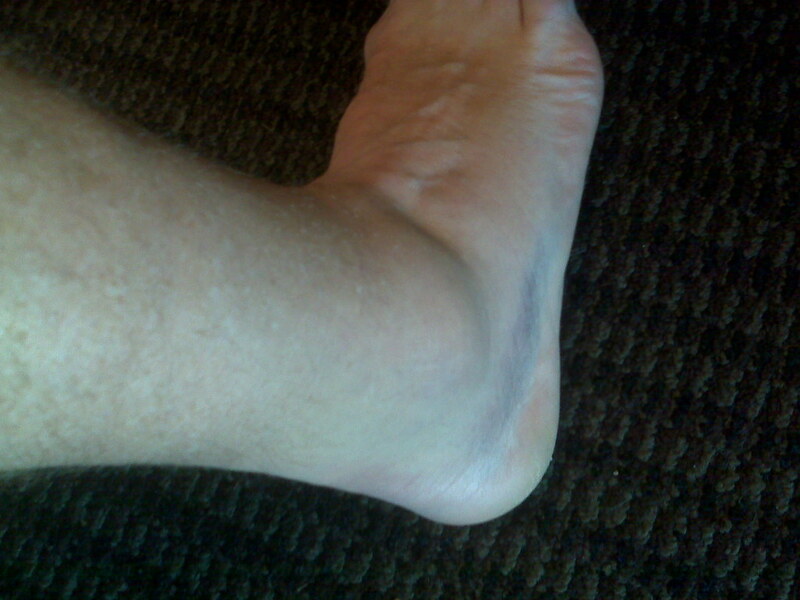 Must be the bowling ball that appears to be wrapped around my foot. Sheesh! Logan wanted me to do Plyometics with her on Tuesday, and so I did a light set and that felt ok too. Wednesday I decided to see if I could run. I headed out on my eight mile loop. Things felt pretty good for the first five miles. Then the pain kicked in so I aborted the run early. Thursday I tried my circuits, and they went well. But my foot hurt on Friday. Friday was really hectic. I met some old co-workers for lunch. That took way some time from my swim; I only got in 2800M. Then I did the light plyometic circuits with Logan. 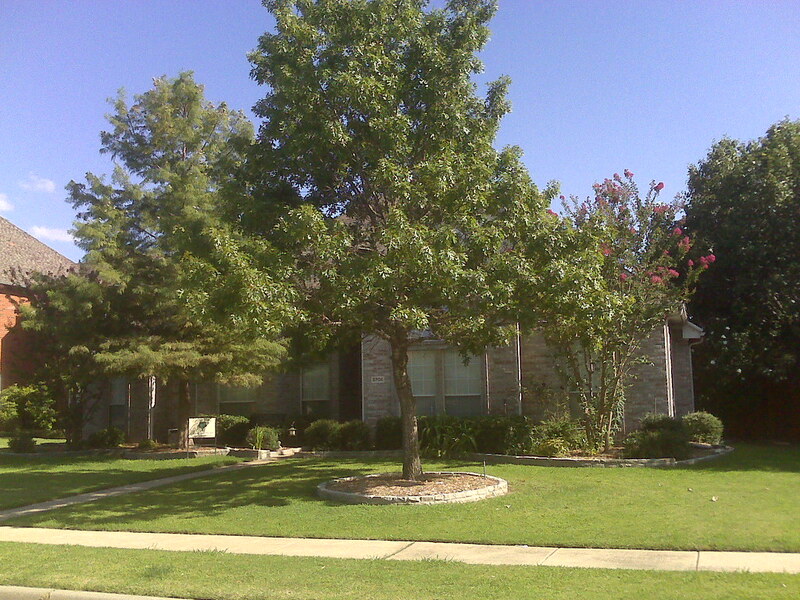 Both Marissa and Logan were scheduled to play in the Plano Premier Qualifying Tournament over the weekend. (In fact the girls went undefeated in six games and both girls qualified for Division 1). But that left little time in morning for workouts. Saturday I met Terry and rode down to LBJ with him. Then Terry headed home, and I rode down to WRL via the creek trail. It had rained Friday and there was LOTS of mud and water on the trail. And it was dark. So that was a bit treacherous. For the return home I headed up Hillcrest Road instead. And because it was so slow going down the trail, I had to hammer it home. Sunday I only had 75 minutes. Instead of running, I did a short bike, which I hope will make my foot pleased. Good News: I did not hurt myself over the weekend, ending the two week trend! Saturday Aug 23: Ride to WRL - Ave 16.8, CAD 71 3:09 Ride time - 53 miles bike. Sunday Aug 24: Ride to Meandering Way - Ave 16.4 CAD 74 Ride Time 1:24 - 23.1 miles bike. Not sure why, but 48 hours after the injury, the bruising has started to appear. Nice Huh? Monday through Friday's workouts felt great. I was not dragging at all during circuits and I had a really strong run on Wednesday. It felt as though the workouts were really coming together. I had planned to due the "beat the heat" sprint tri at the end of this week. However, on Monday they announced that the race was to be postponed by one week. That timing might have been pretty good except that on Saturday I mangled my ankle running in the am. I did wrap it and go for a really strong bike ride on Sunday. And the ankle started to feel really good during the ride. Still I am not sure about racing on it. Sheesh. 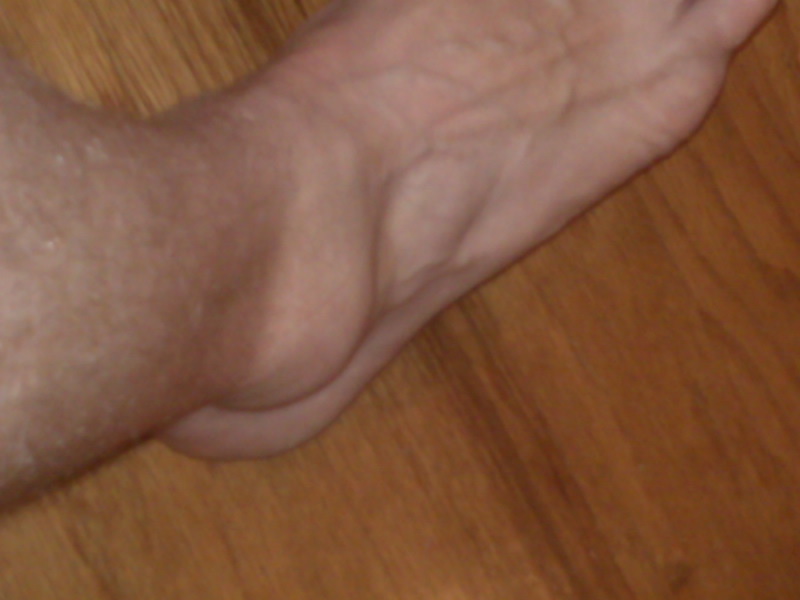 Saturday Aug 15: Sprained Ankle during 4.5 miles run. Sunday Aug 16: Wrapped the ankle and rode down and around WRL. (17 ave, cad 76, 3:03 ride time) 52.5 Miles Bike. This is the second Saturday in a row that I have badly hurt myself. 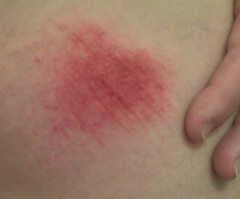 Last week I crashed the bike and wound up with a nasty road rash and hematoma on my right hip. Today I sprained my right ankle. I was out early for a planned 12 mile run. I was about three miles into the run, when I rolled my ankle over the side of the curb. Badly. Really Badly. Loud Pop. Crunching. Severe pain. Lots of colorful language. 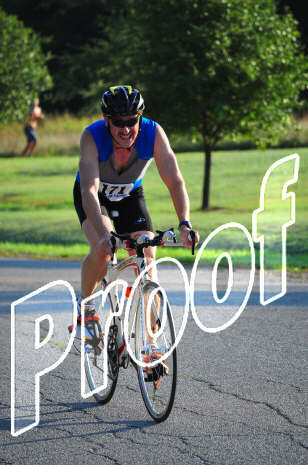 I had been hoping to do the Beat the Heat Triathlon next weekend. Now I am not sure that will happen. Geocities pretty much sucked anyway. You could not do much with the free site as there were lots of limitations on bandwidth and so forth. Still, when I started this blog, I put enough content out there on geocities that it would have been a pain to move. I had abandoned Geocities in favor of several other choices long ago. But that original Geocities content was still out there and still being used on this blog to drive among other things several images in the base template. Well now that they are closing the site, I was put on notice that I must move the content. Which I did. Mostly to Flikr, which is another Yahoo site. Which also raises the question as to why they did not make it easier to move this crap to Flikr. And it also raises the question as to whether I will have to go through this headache again if Yahoo decides to abandon Flikr down the road. We're sorry you have chosen to cancel your membership and delete your home page. At Yahoo! GeoCities, all our members are important to us, and we're constantly trying to enhance our services and strengthen our community. If you have any thoughts on how we can improve membership at Yahoo! GeoCities, we'd love to hear them! HOW ABOUT DONT KILL GEOCITIES COMMUNITY?? And if you are going to kill the community, then DONT ASK ME HOW TO IMPROVE THE COMMUNITY!! Yep. Thirteen. That's 156 months, just in case you were wondering. That's how long we have lived in this house. 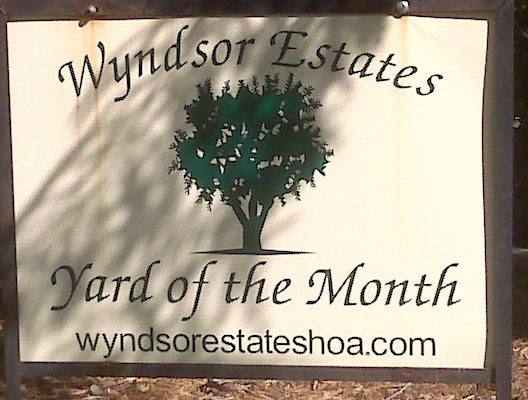 In all of that time, we have never, EVER, been awarded the highly prestigious, "Yard of Month" award by the Home Owners Association. Apparently they felt sorry for us. Coming around some runners on the White Rock Creek Trail. I probably could have stayed on the path, but I jumped onto the grass. There was a nice edge on the concrete trail. I rode for a ways on the grass until I found a spot that looked conducive to getting back on the trail. Nope. Hit the edge and went down hard. Ouch. July was a month of recovery, and transition. No races. I had been hoping to get in a triathlon after track season. However the soccer gods had not been cooperating with that plan. Today Miss Logan had a 3:30pm soccer game and nothing on the calendar for any of the other kids. 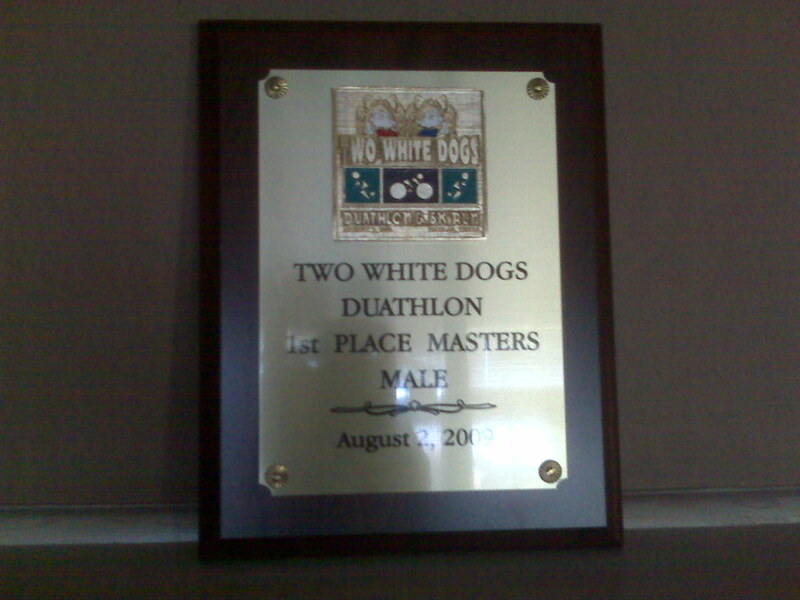 However the only race that was nearby was the strangely named "Two White Dogs Duathlon". I have never participated in a Duathlon before. Throwing caution to the wind, I figured what the heck, might as well give it a try. I arrived down at the Bath house at White Rock Lake about an hour before the race. I did a race day entry. Then I put my bike in transition and headed out for a two mile warm up jog. It was 15 minutes before the start when I returned from my warm up. In my car I had a brand new pair of Brooks T6 racing flats. And when I say brand new, I mean I that opened the box; took the shoes out of the box; pulled the packing paper out of the shoes; and put those shoes on my feet. I know that this is not the recommended procedure for breaking in new shoes. But lets face it, it was about 100 meters jog up to the start. Plenty of time to get those new shoes broken in! Ha! And we were off! The format was 2 mile run, 15K bike, 2 mile run. I jumped out with leaders and felt very comfortable. I had to hold back in fact. At 800 meters, my old running buddy Tom happened to be watching the race so he yelled at me as I went by with the lead group. 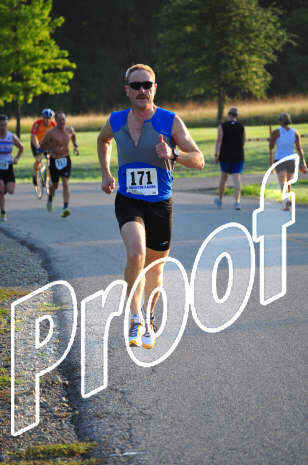 Just before the 1 mile turn I passed the lead runner, and found myself running solo in the lead. Given that I am not very good on the bike, I figured I needed all the lead I could muster in the run. As I came back by my buddy Tom I saw the look of shock and horror on his face, seeing me in the lead! I held my lead into transition, where I slammed on my lid, grabbed the bike and took off. Leading the race coming into transition 1. I was still in first place coming out of the transition. It was not long before the first bike caught me. I knew that guy was going to smoke me on the bike. He was second in the run coming in, so it was going to be unlikely that I could catch him in run 2. It was several miles before the second bike got me. Another mile for the third bike. I held that until about 1.5 miles from the finish, when two more went by me. I held sixth place coming into Transition 2. Dumped the helmet and bike and was in sixth out of T2. Coming into Transition 2. The bike segment would be easier if it was not for the requirement to ride the bike! Those last two dudes that passed me were about 50 meters ahead of me. I caught them in about 600 meters or so. The third place guy was about 50 meters ahead. It took me all the way to the turn to catch him. But this guy was tough! We ran shoulder to shoulder for a couple of hundred meters before I got clear of him. At the 90 degree turn at Dreyfuss House, I put the hammer down in an effort to break him. But he hung on and after the turn he put in a surge. I had nothing more. It was 400 meters up a slight hill to the finish where I hung on for fourth place overall. It turns out that I had the second fastest split on the second run, missing first place by 2 seconds! And I was first overall masters. I gotta learn to ride that bike.